Whether tidying up windblow, removing trees which have died of natural causes or occasionally taking down a tree which has become dangerous, our woodland work produces firewood. This can be bought as pickup loads of hard wood or soft wood logs, split and at least 1 year seasoned, loads of limbs (typically 7 tons of 3m long branches for you to log yourself) or sometimes logs freshly chopped and straight from the tree for you to season at home. Branches and logs don't come in standard sizes so any weights and lengths are approximate and inspired guesses! Loads of limbs appear only occasionally so best to let us put you on a list and we'll let you know when we have a load; we deliver these by tractor and bogie so we only consider local drops up to 10 miles or so; these are charged at £250 delivered and including VAT. Pickup loads of split firewood will cost £150 and are delivered free to the TD1 postal area; outwith that we charge £15 per hour to cover Ian's time and diesel. Freshly logged loads come with a £10 discount as they can come directly from the woods as Ian cuts them. Please feel free to call Ian Robson, our forester, on 07796 178396 to discuss loads and to arrange deliveries to suit you. PS The labrador in the photograph was called Cos and he died in 2016 - he was lovely. 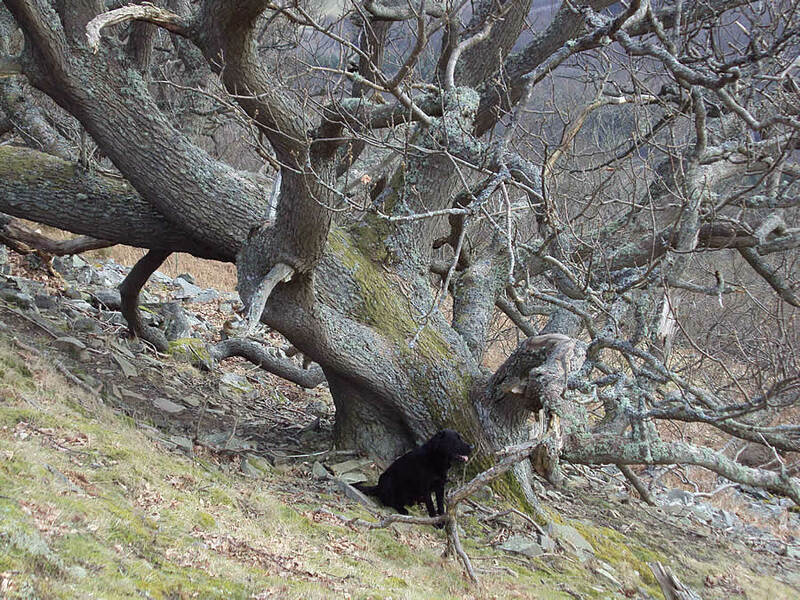 He's pictured sitting beside an ancient oak in the Ettrick Forest remnant which covers a bit of the face of William Law.